Every single day, there seems to be a new superfood juice, protein powder, or supplement on the market that claims to be the solution to all your health woes. Lose weight faster. Build muscle at twice the speed. Drink once a day for instant energy and brain clarity. But these “magic potions” come with a price tag. And while specialty health foods might be helpful tools on your fitness journey, you don’t need to buy into the latest and greatest fads to reach your goals. The infomercials and video ads might make it seem like you’ll never get results without a monthly subscription to their groundbreaking detox tea. But, believe it or not, we think that simple, consistent, healthy choices are just as powerful. So, if you’re trying to lose weight, get toned, and stay healthy without breaking the bank, you’re probably looking for more budget-friendly ingredients (and a less exotic grocery list). Here are fifteen affordable foods to keep on hand if you want to stay healthy without selling your soul. Use this inexpensive whole grain to make overnight oatmeal, or add a handful of oats to your morning smoothie for extra fiber and healthy carbohydrates. Frozen spinach is much cheaper than fresh spinach, and, for obvious reasons, it also lasts much longer. Add frozen chopped spinach to smoothies, scrambled eggs, and soups—it’s the perfect way to add an extra serving of veggies to every meal. With canned tuna on hand, you can always whip up a quick tuna salad for lunch on-the-go. Use Greek yogurt or mashed avocado in place of the mayonnaise to keep it extra healthy. Add fresh lemon juice to your water to jumpstart your metabolism and clear out toxins from your body. Also, use fresh-squeezed lemon juice as a simple salad dressing or a flavor-boost for grilled salmon or chicken. Black beans are the perfect way to add protein, fiber, and a healthy serving of carbohydrates to any meal. Combine black beans and quinoa or rice as the base for a taco bowl, cook black beans with onions and spices for a simple side dish, or use black beans in these healthy, grain-free brownies. First of all, make sure to read the label when you’re buying bread. Stay away from white or bleached flours, added flavors, and preservatives. Once you find a healthy brand, keep a loaf in your freezer and pull out a slice whenever you want to make an open-faced turkey sandwich, a piece of avocado toast, or protein French toast. Bananas are perfect for just about everything: a pre-workout snack, a smoothie add-in, a natural way to sweeten oatmeal, a topping for peanut butter toast, the base for protein pancakes, or the key ingredient for this no-sugar-added banana bread. Add flavor (and anti-inflammatory compounds) to every meal with onions. We love them in scrambled eggs, taco salads, soups, stews, and chili. While almonds aren’t dirt cheap, if you buy them in bulk, they allow you to make almond butter, almond meal, and almond milk at a fraction of the price of the store bought varieties—and all three of those products are staples for healthy cooking and baking. Make a big pot of brown rice during your meal prep session, and you’ll always have a head start on dinner. Use rice as a base for soups, burrito bowls, or curries. Canned chickpeas (also known as garbanzo beans) are an inexpensive and versatile ingredient to keep in your kitchen. Roast chickpeas for a yummy snack, top your salads with chickpeas for extra protein and fiber, or use chickpeas to make your own simple hummus. Lean ground turkey is one of the more budget-friendly meats, and it’s perfect for tacos, meatballs, enchiladas, or stuffed sweet potatoes. Bake a few sweet potatoes or roast a pan of cubed sweet potatoes during your meal prep session, and you’ll have the base for dozens of meals. Use sweet potatoes in healthy skillet meals, sheet pan dinners, autumn soups, warm salads, and taco bowls. Broccoli is the perfect side dish for just about any meal. Our favorite way to prepare it? Oven-roast fresh broccoli with a drizzle of olive oil, a sprinkle of salt and pepper, and a few cloves of garlic until just beginning to brown. Delicious. 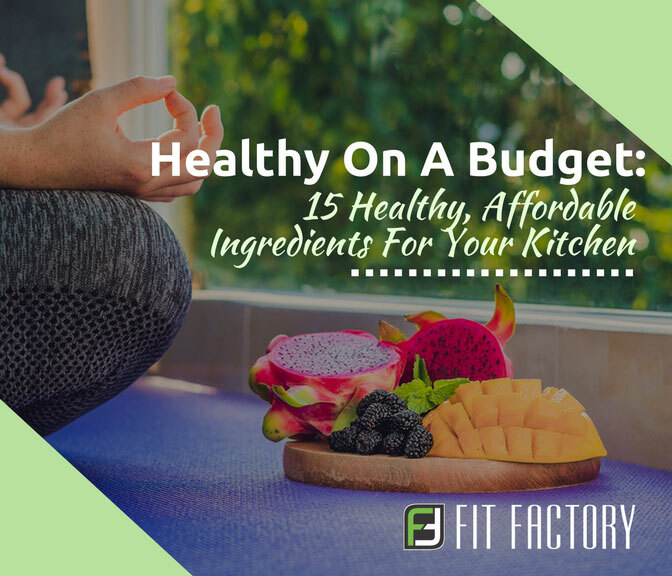 If you keep your kitchen stocked with these fifteen basic ingredients (and maybe a few special extras), you’ll always be ready to make a quick, healthy meal...without worrying so much about the cost.